Name Variation Sybil Emiline Cole was also known as S. E.
Name Variation Sybil Emiline Cole was also known as Emiline. Married Name before 1870 As of before 1870,her married name was Smith. Sybil Emiline Cole was born on 17 February 1820 at Pennsylvania. She was the daughter of Alworth Cole and Hannah Lewis. Sybil Emiline Cole married Ransom Smith before 1870. Sybil Emiline Cole died on 17 August 1911 at Redwood Falls, Minnesota, at age 91. Sybil Emiline Cole lived in 1893 at California. [S249] U.S. Federal Census 1850 U.S. Federal Census, by Ancestry.com, Year: 1850; Census Place: Hampden, Columbia, Wisconsin; Roll M432_994; Page: 127B; Image: 252. [S248] U.S. Federal Census 1860 U.S. Federal Census, by Ancestry.com, Year: 1860; Census Place: Naples, Buffalo, Wisconsin; Roll M653_1400; Page: 844; Image: 390; Family History Library Film: 805400. [S247] U.S. Federal Census 1870 U.S. Federal Census, by Ancestry.com, Year: 1870; Census Place: New Buffalo, Sauk, Wisconsin; Roll M593_1739; Page: 171A; Image: 347; Family History Library Film: 553238. Ransom Smith was born circa 1800 at New York. He married Sybil Emiline Cole, daughter of Alworth Cole and Hannah Lewis, before 1870. Ransom Smith died after 1870. Name Variation Gilman Emery Cole was also known as Gilman Alworth. Gilman Emery Cole was born on 22 January 1827 at Ohio. He was the son of Alworth Cole and Hannah Lewis. Gilman Emery Cole married Sarah Amanda Goss in November 1853 at Reedsburg, Sauk, Wisconsin. Gilman Emery Cole and Sarah Amanda Goss lived in 1880 at Reedsburg, Sauk, Wisconsin. Married Name November 1853 As of November 1853,her married name was Cole. Sarah Amanda Goss married Gilman Emery Cole, son of Alworth Cole and Hannah Lewis, in November 1853 at Reedsburg, Sauk, Wisconsin. Sarah Amanda Goss and Gilman Emery Cole lived in 1880 at Reedsburg, Sauk, Wisconsin. Name Variation Sarah L. Cole was also known as S. L.
Married Name Her married name was Rosencrantz. Sarah L. Cole was born circa 1832 at Pennsylvania. Sarah L. Cole lived in 1893 at California. Rufus C. Cole was born on 30 March 1831 at Pennsylvania. Rufus C. Cole married Mary Lillis Morley, daughter of Isaac W. Morley and Maryette Smith, on 10 February 1872 at Sauk, Wisconsin. Rufus C. Cole died on 4 June 1914 at Minnesota at age 83. Married Name 10 February 1872 As of 10 February 1872,her married name was Cole. Mary Lillis Morley was born on 1 May 1847 at Ohio. She was the daughter of Isaac W. Morley and Maryette Smith. Mary Lillis Morley married Rufus C. Cole, son of Alworth Cole and Hannah Lewis, on 10 February 1872 at Sauk, Wisconsin. Mary Lillis Morley died on 24 October 1917 at Minnesota at age 70. At Excelsior, Sauk, Wisconsin, The settlers of 1849 were numerous. The family of Isaac W. MORLEY came that year. Mr. MORLEY represented a long line of Colonial forbearers, tracing his descent from Isaac MORLEY, Mayflower pilgrim. His parents were Thomas and Lillis (RUSSELL) MORLEY, and his grandparents Thomas and Lucy MORLEY, and Mr. and Mrs. Abel RUSSELL. Isaac MORLEY was a native of Mentor, Ohio, born in 1820. In 1845 at Kirtland, Ohio, he married Maryette SMITH, daughter of Elijah and Rachael SMITH. Their children were: Mary, wife of Rufus C. COLE, of Redwood Falls, Minnesota; Alvin H; Lucius W; Thomas E., who married Addie CRAKER and resides in Reedsburg; Harvey W., for many years an Excelsior farmer; Leaphe, Minnie E.
Carrie J. Cole was born on 29 September 1872 at Wisconsin. She was the daughter of Rufus C. Cole and Mary Lillis Morley. Carrie J. Cole died on 3 January 1933 at Minnesota at age 60. Izro Mary Cole was born in 1875 at Wisconsin. Izro Mary Cole died on 12 May 1920 at Nicollet, Minnesota. Name Variation Josephine Harriet Cole was also known as Harriet Josephine. Married Name 13 November 1858 As of 13 November 1858,her married name was Flynn. Married Name 13 November 1858 As of 13 November 1858,her married name was Flinn. Josephine Harriet Cole was born in 1838 at Pennsylvania. Josephine Harriet Cole married Birney Flinn on 13 November 1858 at Delton, Wisconsin. Josephine Harriet Cole died on 10 May 1893 at Minnesota. [S246] U.S. Federal Census 1880 U.S. Federal Census, by Ancestry.com, Year: 1880; Census Place: Redwood Falls, Redwood, Minnesota; Roll T9_631; Family History Film: 1254631; Page: 31.4000; Enumeration District: 226; Image: 0470. Name Variation Birney Flinn was also known as Flynn. Birney Flinn was born on 25 July 1831 at Canada. He married Josephine Harriet Cole, daughter of Alworth Cole and Hannah Lewis, on 13 November 1858 at Delton, Wisconsin. Birney Flinn died on 5 May 1883 at Redwood Falls, Minnesota, at age 51. Name Variation Dexter Charles Cole was also known as Charles Dexter. Dexter Charles Cole was born in 1846 at Ohio. Dexter Charles Cole died on 7 March 1864 18y, Co. A, 19th Regt. WVI. Barnabus Cole married Sarah Alworth. Sarah Alworth married Barnabus Cole. Name Variation Eugene R. Ruhland was also known as Vernon R.
Eugene R. Ruhland was born on 14 June 1922 at Wisconsin. He was the son of Robert Baptist Ruhland and Elizabeth Hutter. Eugene R. Ruhland died on 23 March 1963 at Wisconsin at age 40. [S250] U.S. Federal Census 1930 U.S. Federal Census, by Ancestry.com, Year: 1930; Census Place: Prairie Du Sac, Sauk, Wisconsin; Roll 2609; Page: 1A; Enumeration District: 33; Image: 404.0. [S373] U.S. Federal Census 1940 U.S. Federal Census, by Ancestry.com, Year: 1940; Census Place: Sauk City, Sauk, Wisconsin; Roll: T627_4523; Page: 13B; Enumeration District: 56-35. 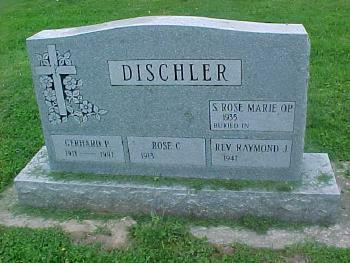 Sister Rose Marie Dischler was buried at St Luke Catholic Cemetery, Franklin, Sauk, Wisconsin. She was born in 1935. She was the daughter of Gerhard Patrick Dischler and Rose Catherine Brickl. Daniel Hensen died before February 2009. Father Raymond J. Dischler was buried at St Luke Catholic Cemetery, Franklin, Sauk, Wisconsin. He was born in 1947. He was the son of Gerhard Patrick Dischler and Rose Catherine Brickl. Georg Blau married Margaretha Gruber. Married Name Her married name was Blau. Margaretha Gruber married Georg Blau. Franz Dobmeier married Anna Maria Schinabeck. Married Name Her married name was Dobmeier. Anna Maria Schinabeck married Franz Dobmeier. Alois Blau was born on 2 October 1872 at Wisconsin. He was the son of Michael Blau and Barbara Dobmeier. Alois Blau died before 1880. Anna Blau was born on 25 April 1878 at Wisconsin. She was the daughter of Michael Blau and Barbara Dobmeier. Anna Blau died before 1880. Name Variation Georg Zilker was also known as Zilk. Georg Zilker married Barbara Ruhland before 1842. Married Name before 1842 As of before 1842,her married name was Zilker. Barbara Ruhland was born on 24 June 1817. She married Georg Zilker before 1842. Barbara Ruhland married Franz Xavier Zilker before 1848. Name Variation Franz Xavier Zilker was also known as Xavier. Franz Xavier Zilker married Barbara Ruhland before 1848. Johann Baptist Ruhland was born on 10 May 1797 at Bavaria, Germany. He was the son of Wolfgang Ruland and Anna Ursula Karl. Johann Baptist Ruhland married Katharina Ederer on 17 October 1824 at Bavaria, Germany. Johann Baptist Ruhland died on 24 April 1876 at 81y, Plain, Sauk, Wisconsin, at age 78. Name Variation Katharina Ederer was also known as Katharine. Married Name 17 October 1824 As of 17 October 1824,her married name was Ruhland. Married Name 17 October 1824 As of 17 October 1824,her married name was Ruland. Katharina Ederer was born on 19 March 1809. She married Johann Baptist Ruhland, son of Wolfgang Ruland and Anna Ursula Karl, on 17 October 1824 at Bavaria, Germany. Katharina Ederer died on 13 December 1888 at 79y at age 79. Married Name 6 October 1915 As of 6 October 1915,her married name was Ruhland. Christina Schwartz was born on 17 August 1891 at Wisconsin. She married Simon J. Ruhland, son of Joseph C. Ruhland and Margaret K. Fell, on 6 October 1915. Christina Schwartz died in 1982.